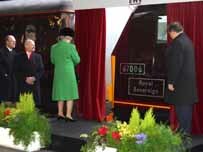 The Queen has named the locomotive used on the Royal Train, 67006 Royal Sovereign at Bristol Temple Meads. The locomotive, painted in royal claret, joins Queen’s Messenger, as the only two locomotives in Britain responsible for hauling the Royal Train. The first Royal Train ran on 13 June 1842, when Queen Victoria and Prince Albert travelled from Slough to Paddington.